This weekend I got the chance to read some of the stories in Gary Myers’ Dreamlands stories anthology The Country of the Worm, collecting his various grim & evocative fantasies: I’m beginning to think he’s darker than either Lovecraft or Dunsany. However, I spent most of the weekend drawing, while listening to Yog-Sothoth.com’s Cthulhu podcasts — their general-nerdiness podcast “The Silver Lodge” and their new Cthulhu Invictus Roman campaign. It’s great to get to listen in on their gaming sessions; they’re such great roleplayers and they’re always funny. 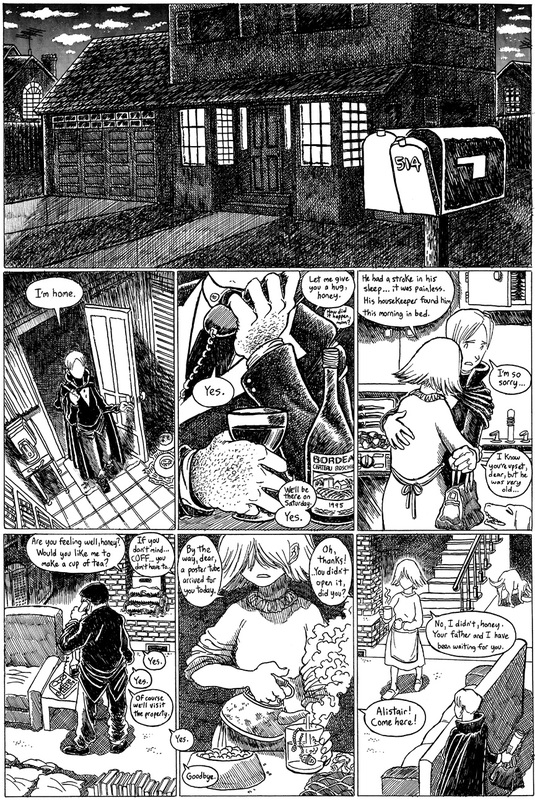 Looking back over “The Stiff,” one thing I notice about my old pages is, the handwritten text is often extremely small. I can’t believe I posted this at even lower resolution at girlamatic back in the day. Well, if anything’s illegible, that’s what comments are for!